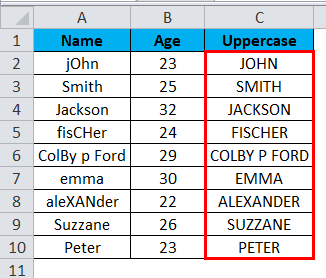 How to use Uppercase in Excel? Uppercase in excel refers to the usage of capital letters for writing words and sentences. While typing in MS Word, you must have noticed that the first letter of a new sentence automatically gets capitalized. Also, we can use the ‘Change Case’ function in MS Word to toggle between upper case and lower case words. However, we do have various functions in MS Excel that can help us in changing the case of words from lower case to upper case. One of these functions is the ‘Upper’ function. 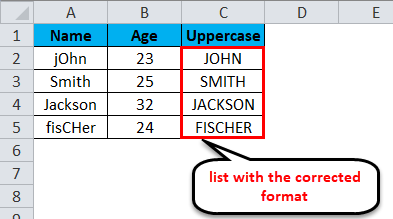 This Uppercase function in excel is particularly useful at places where the entire word or the entire string that is stored in a cell is to be capitalized. We cannot have only the first letter of a word capitalized with the ‘Upper’ function. Note: There is another formula as well for changing the case of words, like ‘PROPER’, however, we will be discussing only ‘UPPER’ in this article as ‘PROPER’ changes only the first alphabet of a word. Before we start learning how to change the words from the lower case to the uppercase, let us have a look at how the upper function would work and what the output will look like. Consider the image given below that shows the names of various persons. You can see that the names have been entered inappropriately. Some alphabets are in lower case, some are in upper case. This issue can be corrected and we can convert the entire text into uppercase alphabets by using a very simple formula that is known as ‘Uppercase’. Similarly, we can convert other values. The image given below shows the list with the corrected format. As we have already discussed that unlike MS Word, MS Excel does not have an easy option of changing the case of words from lowercase to uppercase and so we use the formula of Uppercase. The only drawback of using Uppercase is that we do not have an option of selecting whether we want to change the case of all the letters or only the first letter. It always changes the case of all the alphabets that are present in a particular cell. Let us try to understand how to use this formula and what parameter we should put in it. Let us look at the below screenshot. We can see that as soon as we start entering the text “=upper”, MS Excel automatically displayed the formula and also the hover text explaining the purpose of the formula. Once we press the ‘Tab’ button, the formula is entered in the cell and then we need to select the cell whose value we wish to see in uppercase alphabets. Refer to the screenshot below for more clarity. We have selected the cell ‘A2’ (by clicking on it) after we entered the formula in the cell where we wish to get the output. Once the input cell reference (‘A2’ in this case) has been entered, we can close the bracket and press the ‘Enter’ key or simply press the ‘Enter’ key to get the text converted into uppercase. The output is shown in the image below. 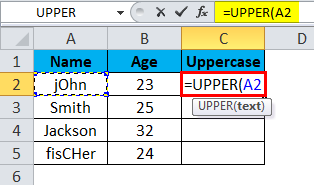 Like every other function/formula that we use in MS Excel, we need to define parameters for ‘Upper’ also. 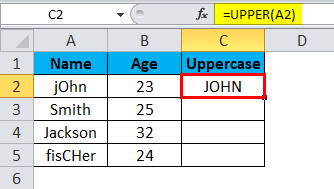 We cannot enter multiple cell references in the formula of uppercase. However, if more than one word is written in a cell, then all the words will get converted to uppercase after we execute this formula. Which has also been shown in the above image. 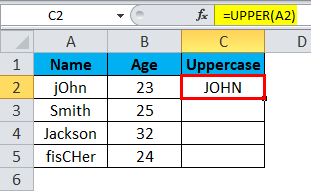 We can use the uppercase formula on multiple cells by simply dragging it (just like any other formula of MS Excel). Follow the below steps to understand how to use the ‘Upper’ function in MS Excel to convert the alphabets in a cell to the uppercase. 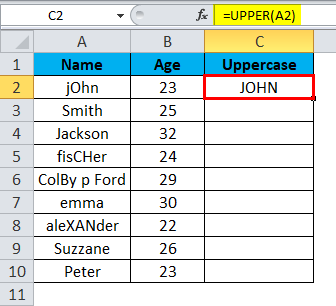 Considering that you have a list of items in column ‘A’ in your Excel file and that cell ‘A1’ is used as the column header and we do not need to capitalize it. This means ‘A2’ will be the first cell that we need to capitalize. Step 1: Click on the cell where you wish to get the capitalized version of cell ‘A2’. Let us assume it to be ‘C2’ in this case. Enter the formula: “=UPPER(A2)” and hit the enter key. You will see that the word (or string) written in ‘A2’ is capitalized in ‘C2’. Step 2: Now simply click and drag the pointer from C2 till the cell whose values you want to be capitalized. For example, if the list in column A is till ‘A10’, then hold and drag the ‘C2’ column till ‘C10’. (Hold after clicking on the bottom right part of the 1st cell (‘C2 in this case)). The final output will look like the one shown in the image below. 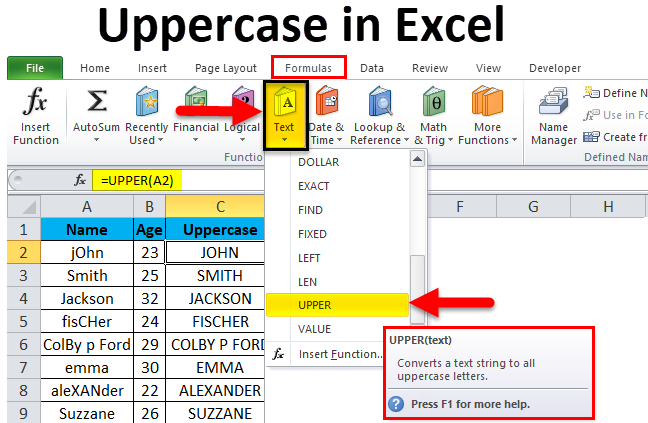 Uppercase function in Excel helps you to convert the text to all upper case which is capital letters. 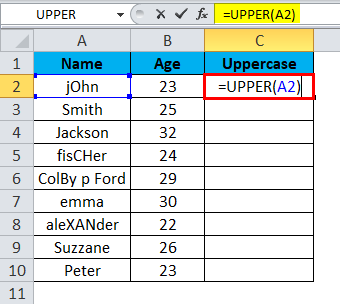 While applying uppercase in excel, we need to keep in mind a few things. Some of them are listed below. The ’Upper’ formula accepts only one input parameter. This formula capitalizes only one cell at a time. We cannot capitalize the entire list in one go with this formula. However, any number of words or strings that are present in the input column will be capitalized in the output with this formula. After applying the ‘Upper’ formula if we remove the input list (words), the output list (words) will also be removed. An easy and direct way to get rid of this problem is by copying the entire contents (i.e. 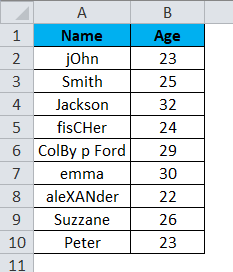 the list) and pasting them as values in the same column or any other column. This would ensure that the capitalized values are not deleted. 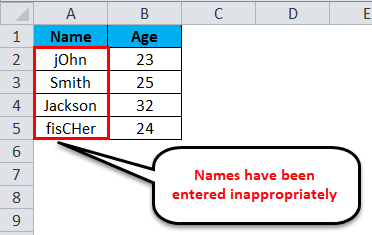 Also, values would appear instead of the formula after we copy and paste values in the column. How to Calculate Absolute Value?